This week was a better ball competition with another record entry of 48 players. 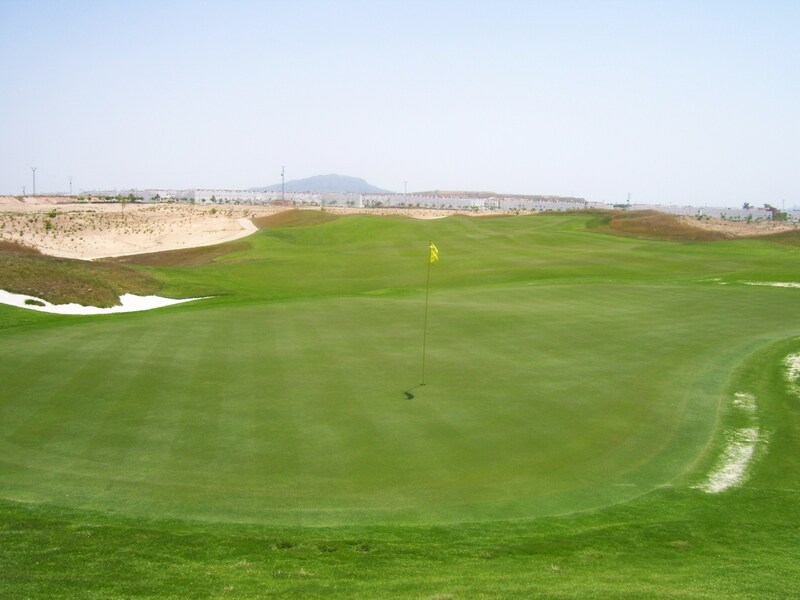 We have now had over 260 players of which 50 are single figure golfers, Also the average handicap is 15.8. 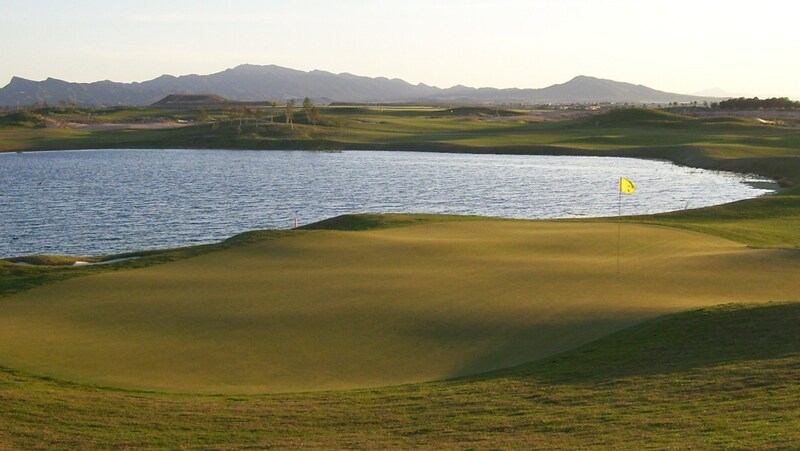 The featured hole this week is the par 5 9th. A record entry of 40 players who all turned up (sorry Anthony thanks for standing by). Todays comp was a yellow ball with each member of a 4 person team taking their turn to face the pressurised situation of their score having to count and with their score being doubled trying to avoid the dreaded zero points! 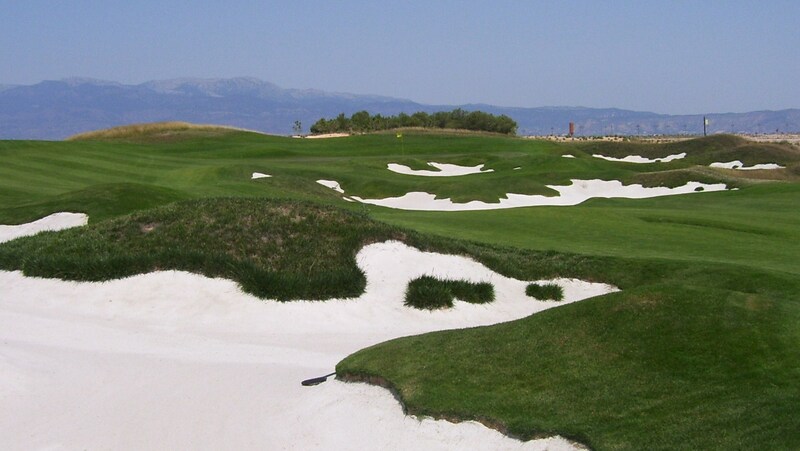 Graham and I had a meeting with the director of golf sales for Olagolf (Alfred Caparros) this week. He is trying to promote the use of the course and believes that this can be best be achieved through the society. He wants us to make contact with other societies to use Condado where they would benefit from our society prices. 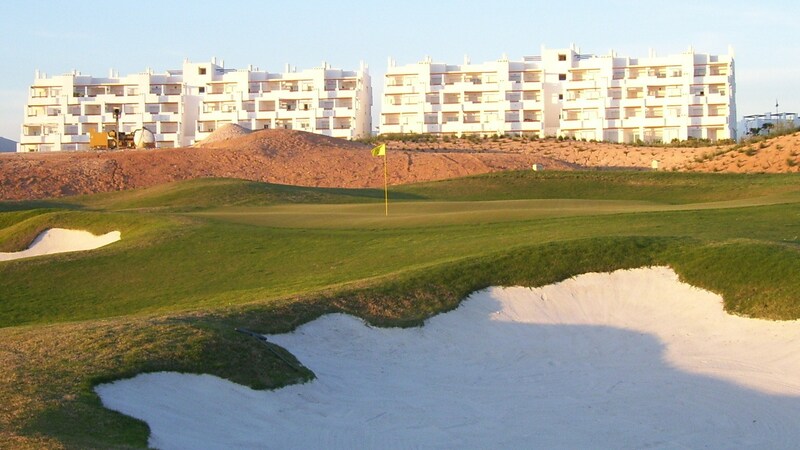 As Olagolf also own Mar Menor and Terrazza de la Torre we can also go there and play for our society price (30E at moment). Their members can also do the same at Condado. A review of prices has taken place and reductions across the board are now available. Also looking at short term membership deals for 1, 3 and 6 months. 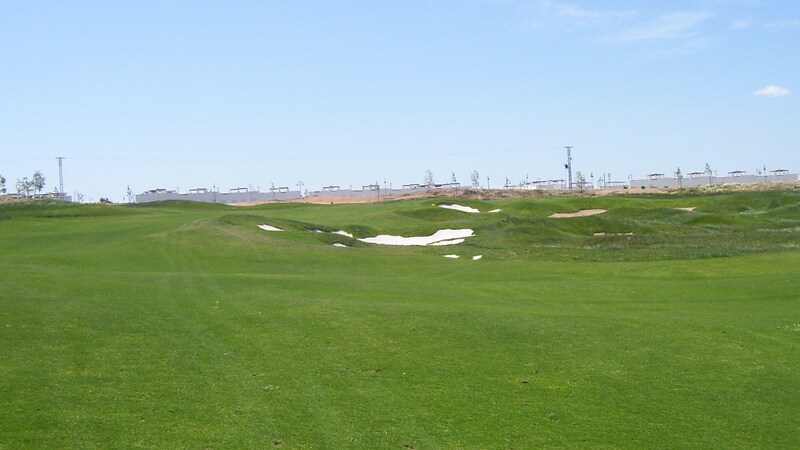 This is good because it makes us competitive with other courses in the area. Also although the course is in superb condition the surrounds have left much to be desired, but work has been done over the last month and weeds have been removed all around the course making it look much more attractive to visitors. Hopefully the temporary clubhouse will be complete before October and will provide services at the moment lacking in the Al Kazar owned by Polaris World. There will be changing rooms, showers, a restaurant which will open early and provide breakfasts, snacks etc, 2 bars one for the public and one for the society/members. Prices will be more competitive than PW and service will be much better. 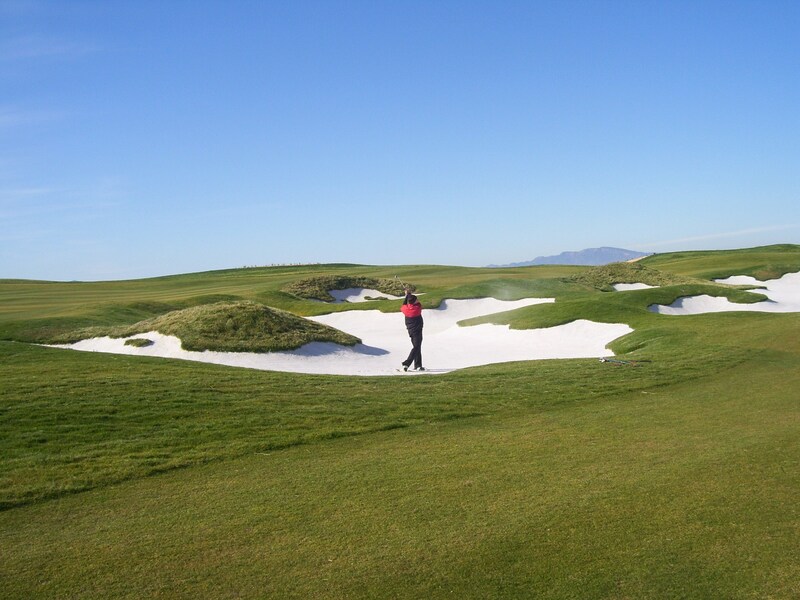 Buggies will now be allowed to access the fairways under the 90 degree rule. 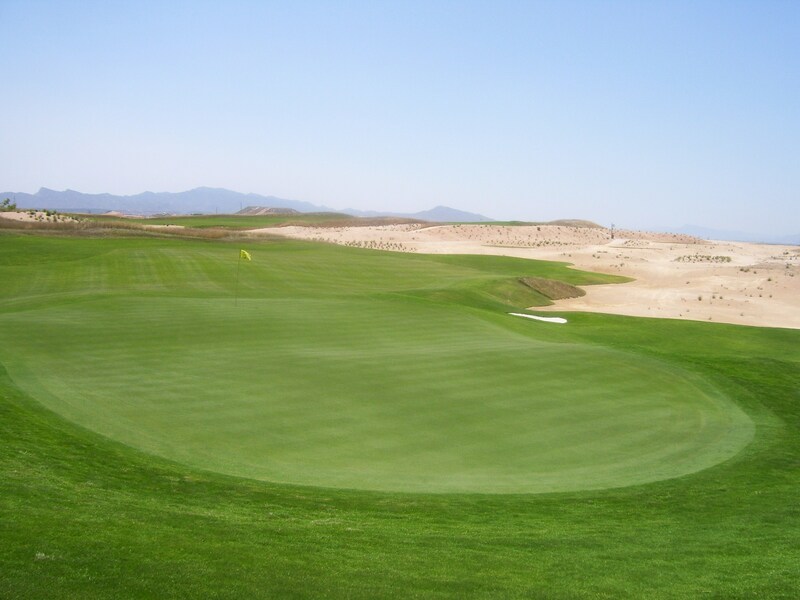 Olagolf look to be doing everything in their power to make our Jack Nicklaus signature course a success. It is good that they are involving us (the society) in decision making as opposed to Polaris who did not communicate or act in the best interests of our members. Anyone wishing to play contact me ASAP so we know how many tee times to reserve. I believe we will get a record entry of perhaps 80 players that week. (Note it is on a saturday). Also anyone wishing to help in some way (hand cards out, collect entry money, check cards, measure nearest pin, take photos etc will be most welcome. The presentation will then be at the Clover in the evening followed by a great social night for players, partners and anyone else who wants to join us. 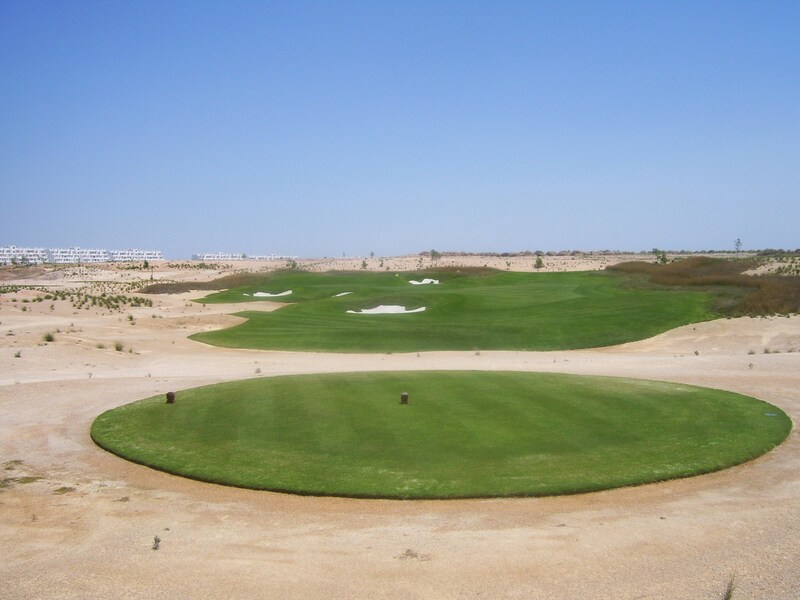 Although we teed off from 08.30 it was a real scorcher which must have affected scores as only one player beat 36pts. A record entry of 39 players on the individual stableford. Had 2 divisions (3 prizes in each). Next week is again an individual stableford and note captains day is August 13th with lots of prizes and a get together at night! Featured hole this week is the par 3 7th. Head greenkeeper met me on 12 th for comments about course. I said fairways were much improved and greens had recovered after hollow tining. He asked about speed of greens and I told him they were slower than they were on opening and faster than after hollow tining-they are average pace. He said the hot weather meant they could not be cut lower which I could understand. The long rough will will be cropped completely in the autumn and be allowed to grow again later. 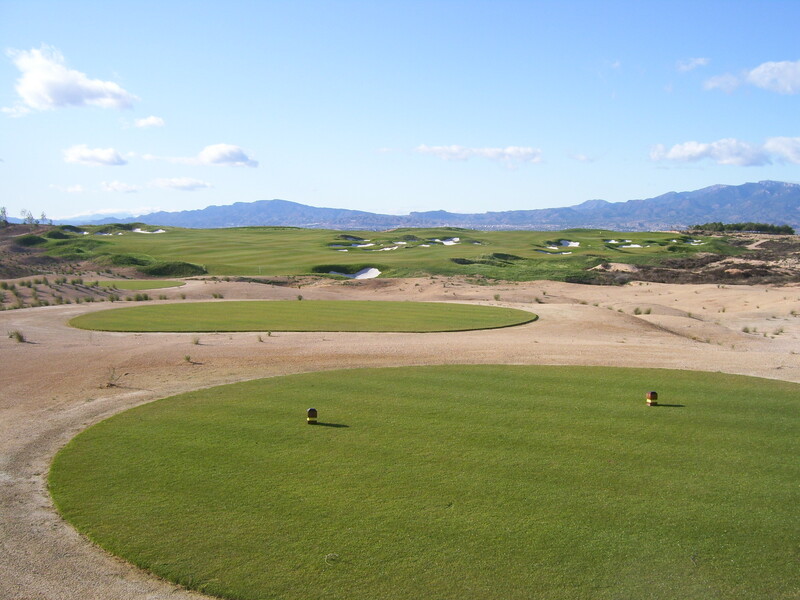 The fairways (pasalpum) are dormant in winter and the rough is dormant in summer. I said Olagolf seemed better than Polaris and he said more staff had been employed and more money spent on the course since the changeover. Work continues clearing weeds in front of the penthouses – so far cleared block 16. 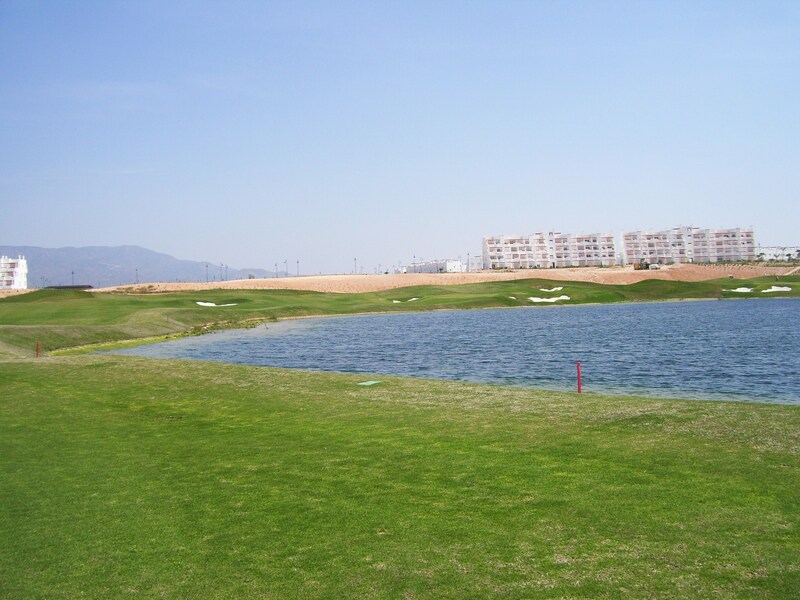 I asked about the low water levels between 9 and 18 and would aquatic plants be planted as proposed – he said he wished to do it and was awaiting his budget from Olagolf. The girls in the shop told me a famous spanish television presenter had played today and did I know him. I didn’t and told them I was more famous than him on Condado! A great entry today of 30 players for the individual stableford event. Played in scorching weather the early tee times did not help and we were all grateful to Antonio for bringing water round twice during the round. Some very good scores again. Well done especially to James who did a gross 70 off 1 handicap! We now have over 240 playing members whose updated handicaps can be seen on the society noticeboard in the golf shop. You can also find next weeks starting sheet and this weeks results there. This weeks featured hole is the 6th where the green cannot be seen from the tee, with deep rough on either side of the fairway. 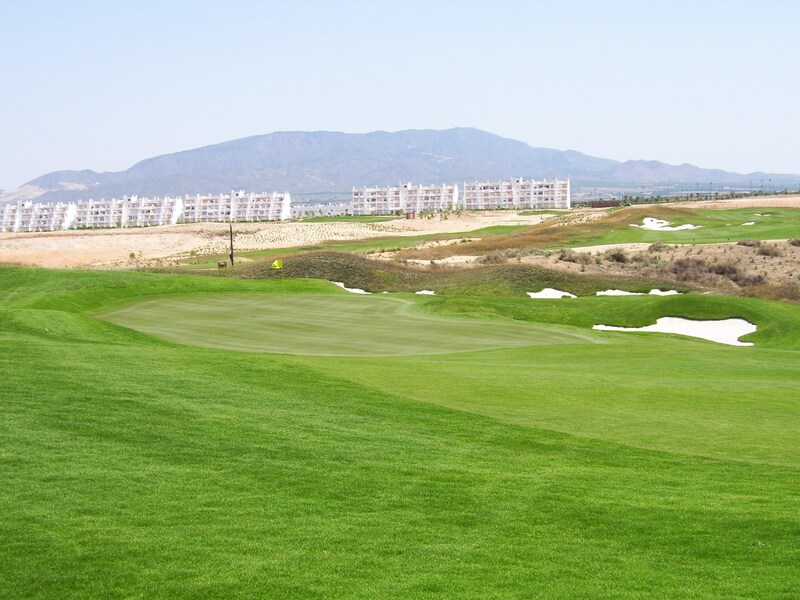 There is a great view of the Sierra Espuna mountains in the background over the brow of the fairway. Today it was a 3 man team event (2 best scores to count) and we had 9 teams – a great entry! Finished before the rains came and only problem was we couldn’t have presentation in clover as it clashed with world cup match. 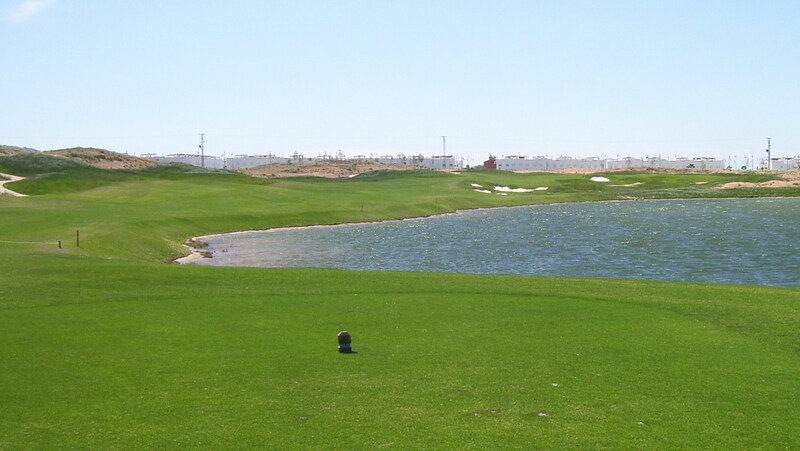 Just a reminder – it is essential for any player to enter his/her gross score at each hole – not just points scored otherwise it is impossible to check the card. 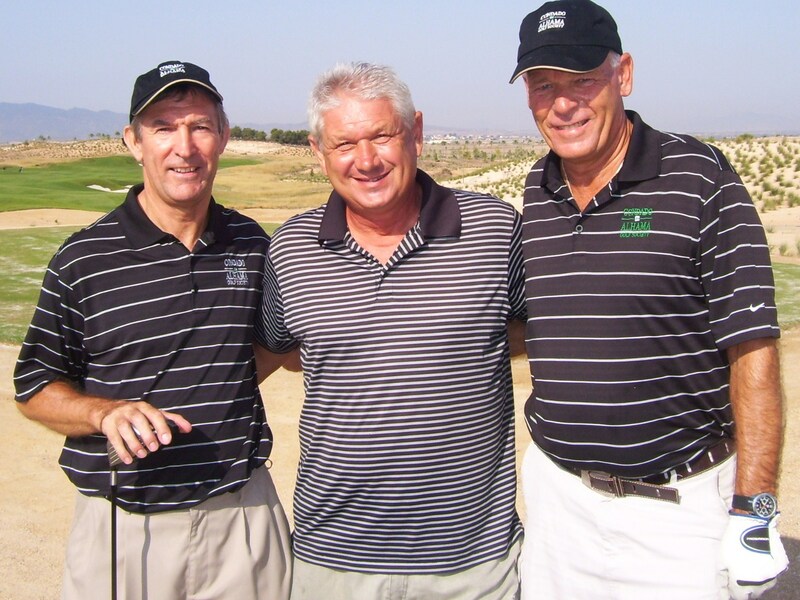 The featured hole this week is the 5th and also photo of John Brown, Barry Barker and Graham White before they lost 2nd place on the countback! Also there is now a coffee and drinks machine in the golf shop as Polaris don’t like opening to serve customers…..